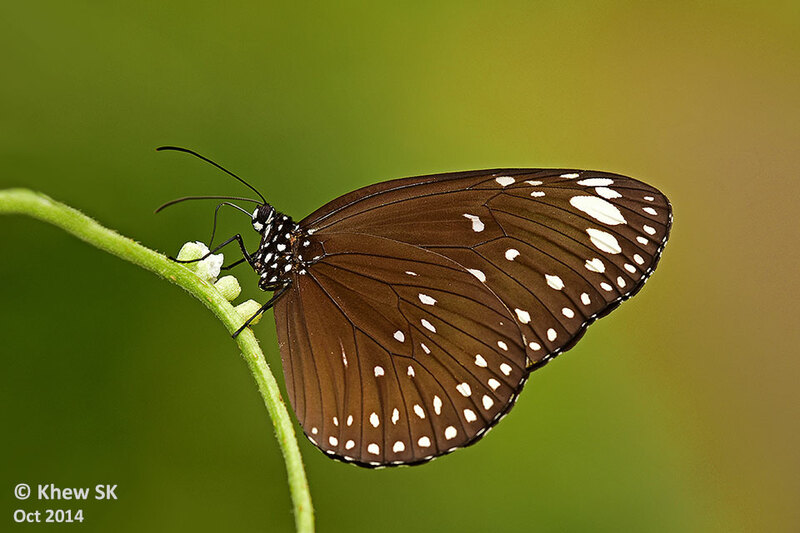 Another twelve months have whizzed by, and we are already on the threshold of a new year. As we look back at 2014, it was a year where ButterflyCircle members made more trips beyond the shores of our little Red Dot than in previous years. Exploring further afield in the past years also paid good dividends when Dr Laurence Kirton needed field shots of live butterflies from Malaysia, Singapore and Thailand for his new book. 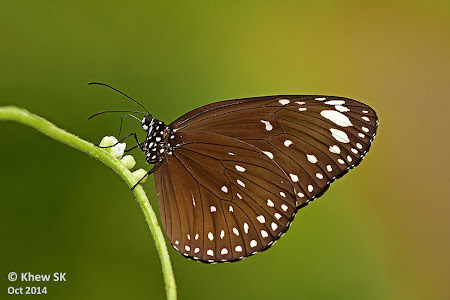 In this final blog article for 2014, we share some of the key events that ButterflyCircle members were part of, and news-worthy snippets of our winged jewels in Singapore (and also a few stories from the region). 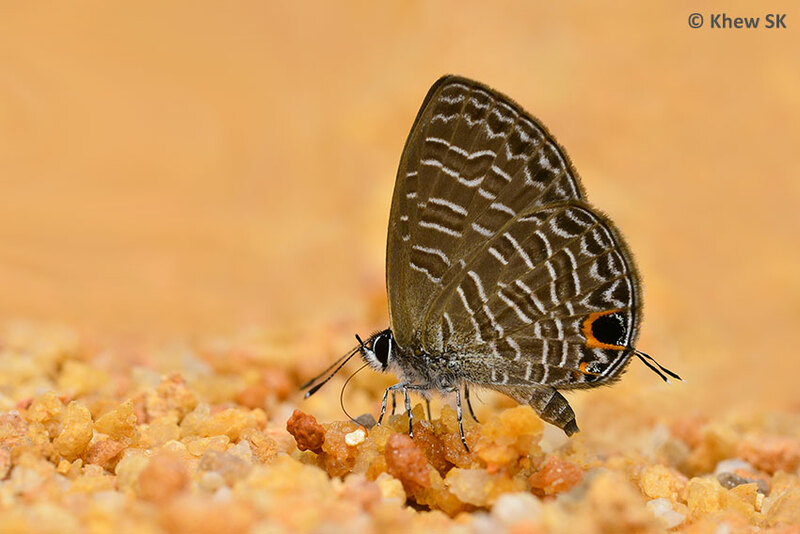 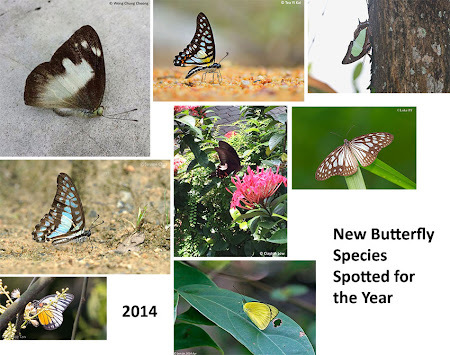 It was another eventful year for discoveries and re-discoveries on the Singapore butterfly scene as some new species made their appearance for the first time here. Undoubtedly, these may be seasonal or accidental migrants, but with clear evidence of the sightings of these species, we have included them in the Singapore checklist. 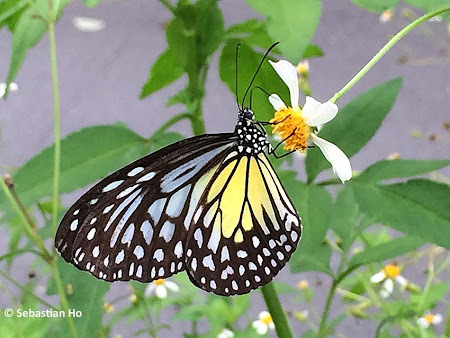 All in all, we posted a total of 132 entries on this blog, with articles ranging from new finds, butterfly attracting plants, events, and other butterfly news from Singapore. Though not as many articles as our bumper year in 2013, where we logged a total of 188 posts, 2014 was an awesome year nevertheless. 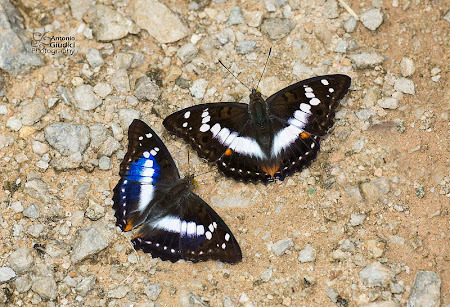 Our forums continued to remain active, as a platform for serious discussion as well as learning the finer points of butterfly identification from our resident guru, Dr TL Seow, who deserves more than a few kudos for his sharp eye for detail and also responsible for adding quite a number of 'lifers' to ButterflyCircle members' photographic tally. With the FaceBook 'Butterflies of Singapore' (which should notably be known better as 'butterflies without borders') group very active, the reputation of Singapore's butterfly photographers has spread regionally and well beyond our little island in the sun. 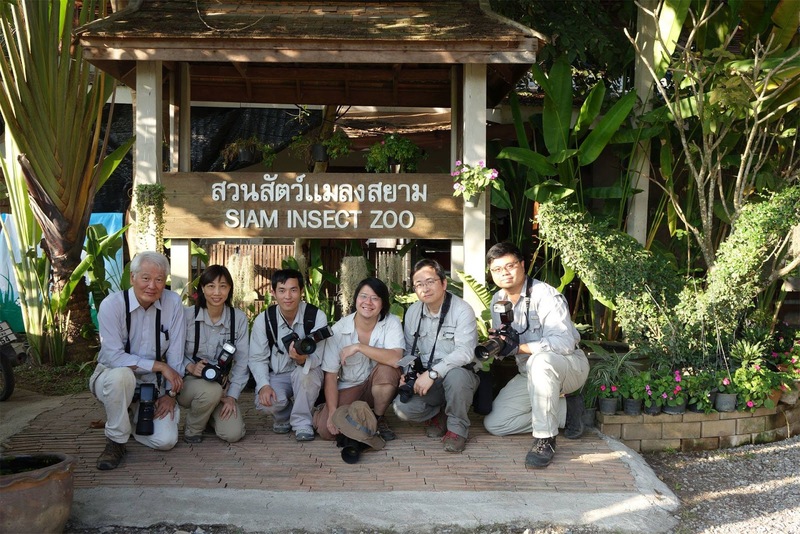 With a total membership of over 4,750, the FB group has a following of members from all around the world. 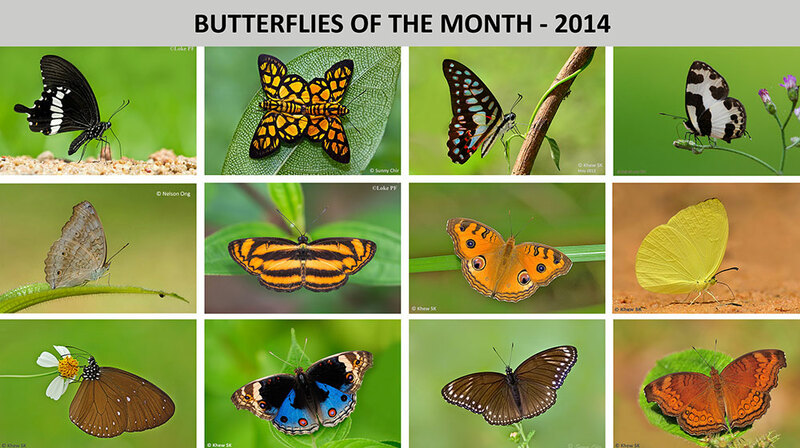 Not bad for a group that specialises only in the sharing of photos and information about butterflies! 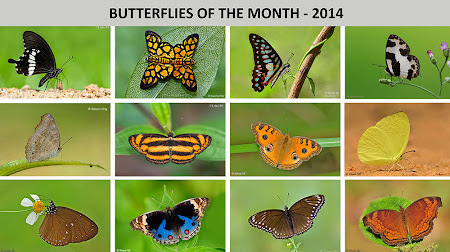 Our regular feature articles series, the Butterfly of the Month, is now into its seventh year and going strong, with a total of 86 butterfly species featured every month from Dec 2007 to Dec 2014. 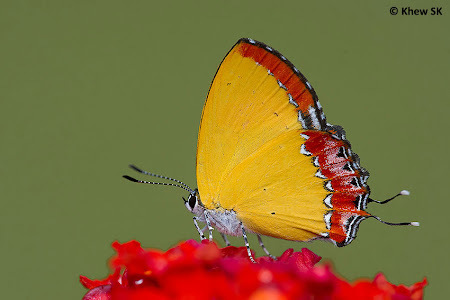 Each article features multiple butterfly photos from the excellent portfolio of ButterflyCircle members. 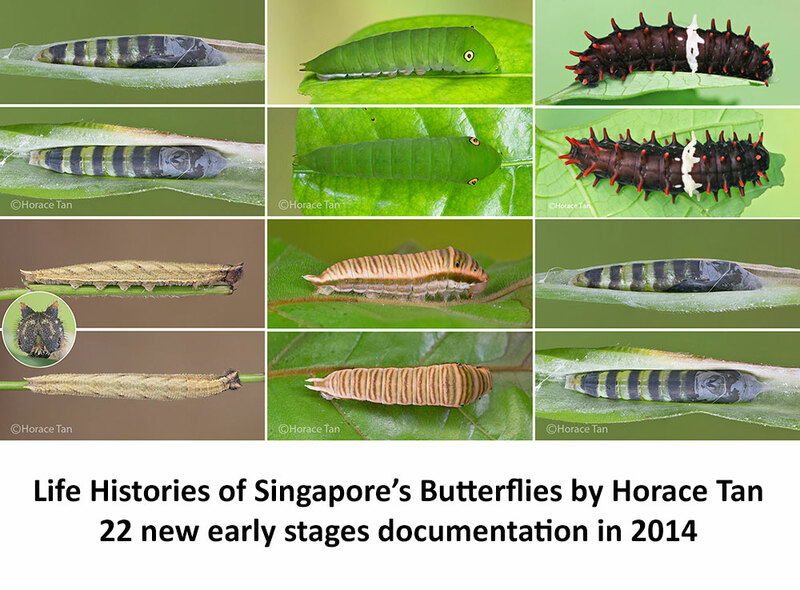 Horace Tan, our life history expert, continued with his peerless detailed documentation of the early stages of Singapore's butterfly species. In 2014, Horace's butterfly life histories series delivered a total of 22 full documentation from egg to adult with amazing detail - a testimony to his exceptional patience and determination to capture the early stages of butterflies. 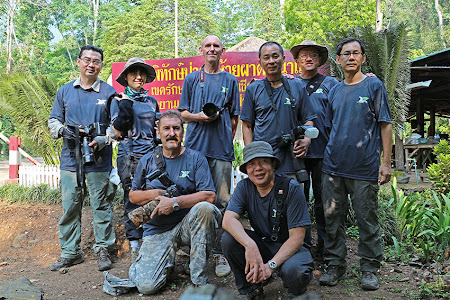 We started the year with a short travelogue by ButterflyCircle member Mark Wong, who joined a team of Hong Kong butterfly shooters in Chiangmai, Thailand. 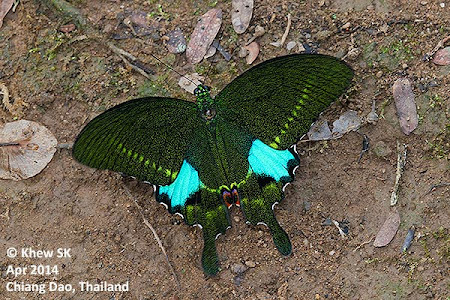 Mark shared his adventures in Chiangmai and the surrounding areas that were rich in butterfly biodiversity. 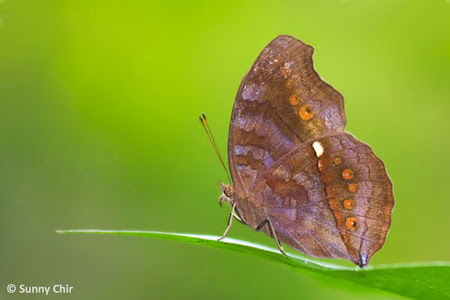 This sparked off several other 'expeditions' to Chiangmai by ButterflyCircle members in Apr/May, Oct and Nov/Dec this year to capture the awesome beauty and biodiversity of Thailand's butterfly fauna. Our members' forays into Thailand yielded so many excellent butterfly photos from the northern Thailand region that would fill a good coffee table book! 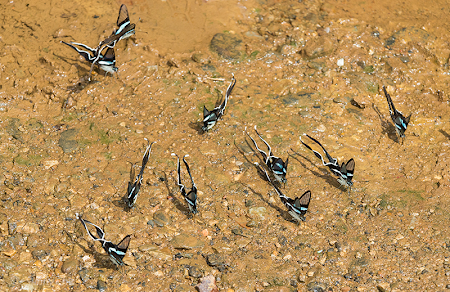 Amongst some of the notable species encountered are featured here - showing the diversity of species and subspecies just a couple of hours' flight time from Singapore! 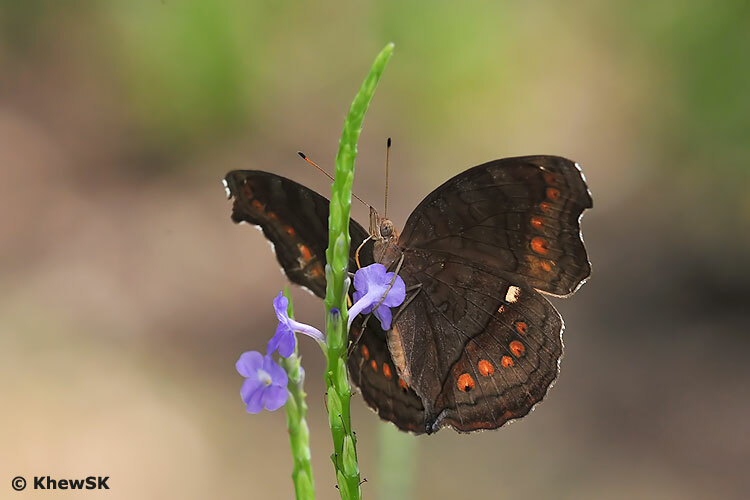 ButterflyCircle members also made trips up to Malaysia - Gopeng, Lata Kinjang, Kuala Woh, Gua Tempurung and Penang to get our fill of 'capturing' more species on our cameras' sensors and enjoying the beauty of butterflies in our Southeast Asian region. It is likely that in the coming years, we will be taking our hobby to more exotic locations, like our friends from Hong Kong. April was an eventful month when Dr Laurence G Kirton launched his book, A Naturalist's Guide to the Butterflies of Peninsular Malaysia, Singapore and Thailand on 24 Apr at Gardens by the Bay. 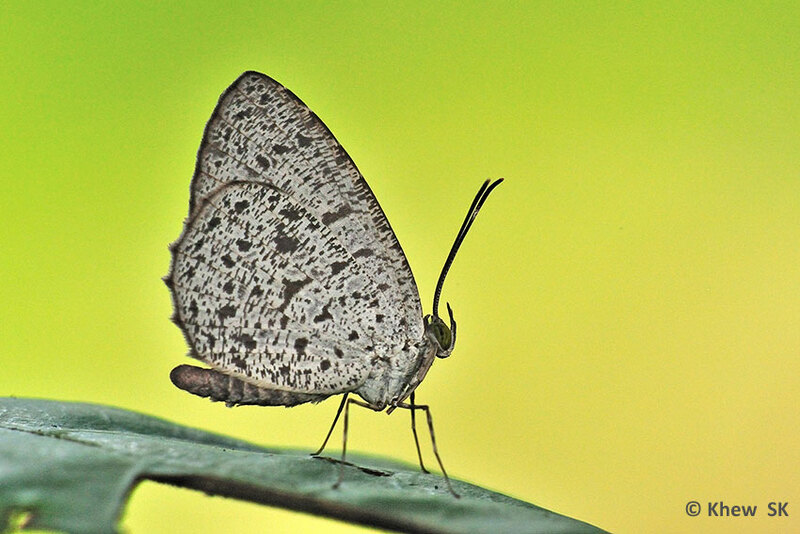 It was the first attempt by any author in the region to write a book about butterflies covering three countries of Southeast Asia. Though the book featuring about 280 species is just an appetiser to the large number of species in these three countries, it is a good introduction to the rich biodiversity of the region. 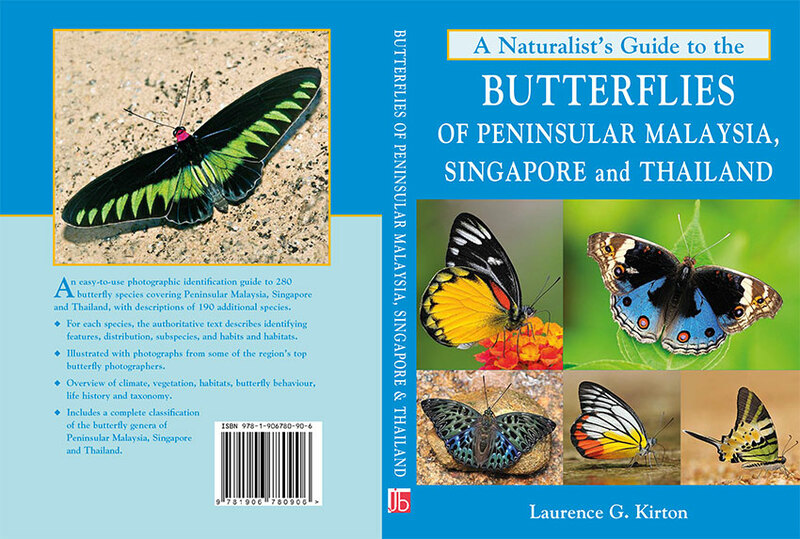 ButterflyCircle members contributed about 75% of the photographs in Dr Kirton's book. 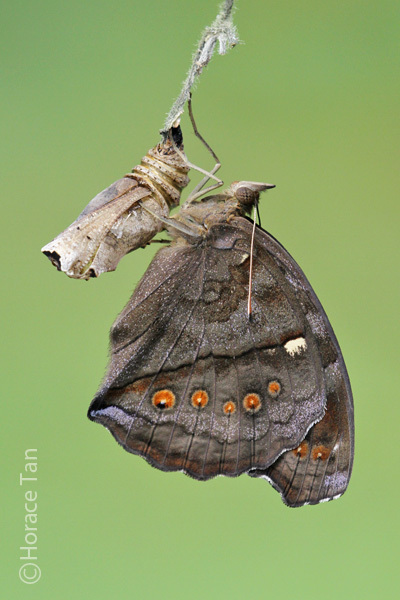 Our youngest ButterflyCircle member, Brian Goh, sharing his knowledge about butterflies with a visitor to our booth at Festival of Biodiversity 2014. 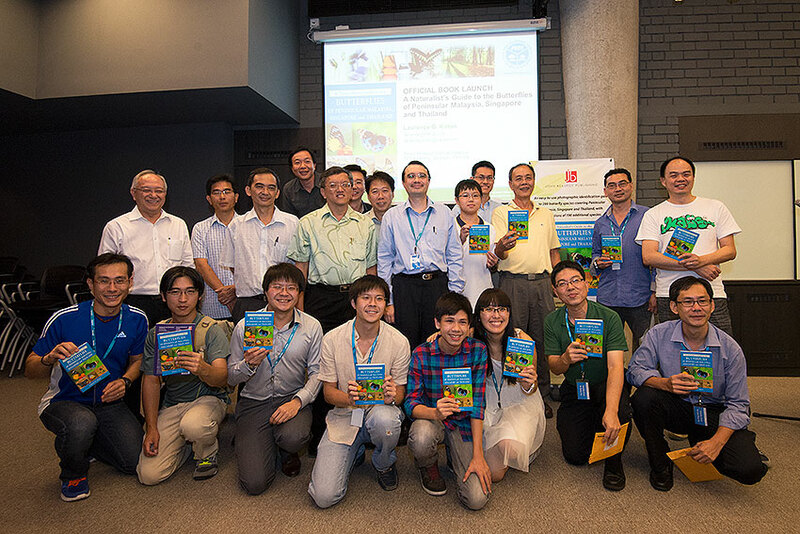 ButterflyCircle participated in the 3rd Festival of Biodiversity at VivoCity. 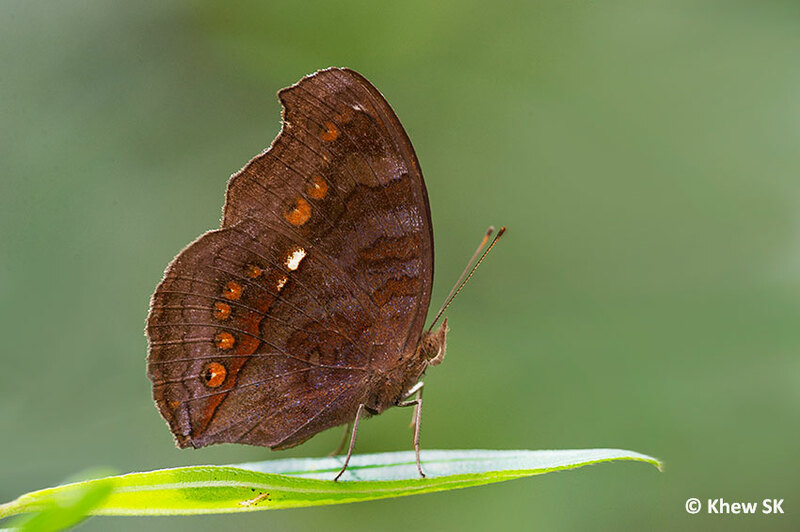 Having been involved in the first two festivals, the 3rd instalment of this annual event proved to be even bigger and ButterflyCircle had a dedicated booth to feature our members' work and to promote the group. Special thanks to all our regulars who contributed their time and effort to volunteer at the FOB 2014 and to the National Parks Board for inviting us to the FOB 2014. 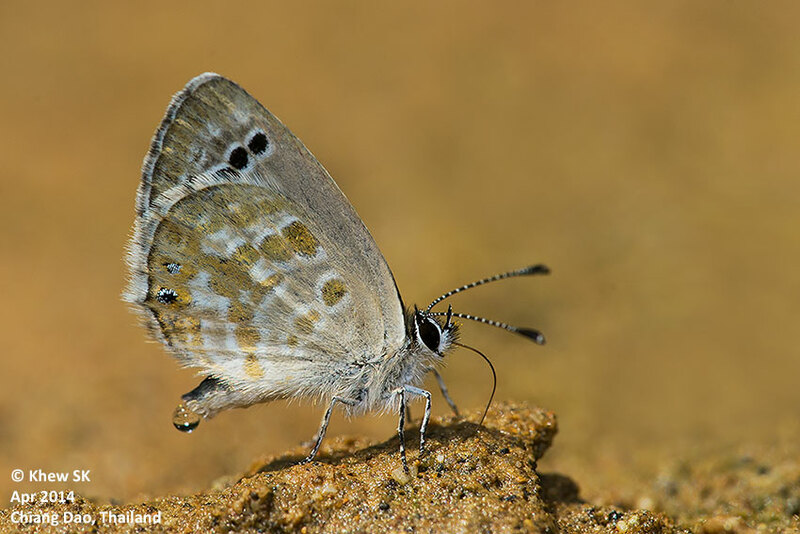 In an effort to standardise the English Common Names of butterflies in Southeast Asia, we also wrote several articles on this blog to rationalise the adoption (or otherwise) of current common names and propose some new ones. In our hobbyist and amateur world of trying to appreciate butterflies, it is often easier to coin common names than to use the tongue-twisting scientific names. 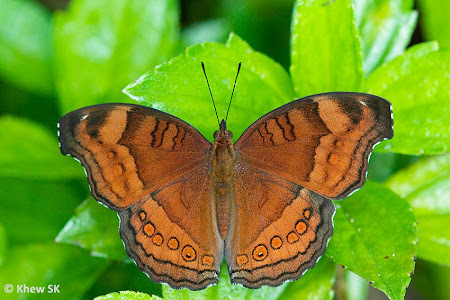 However, the use of common names often run into problems when different countries' butterfly enthusiasts come up with new names for similar species. 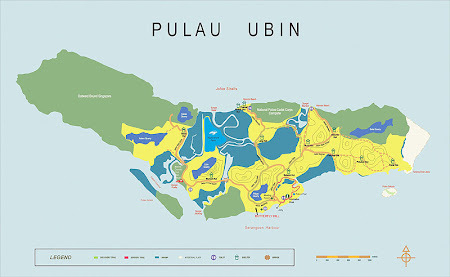 This will be an ongoing attempt to try to at least standardise the common names across Malaysia, Singapore and Thailand. November was an exciting month for Pulau Ubin, a small offshore island of Singapore which is a hotbed of biodiversity, and where nature groups are working with the government to conserve as much of the island's natural heritage. 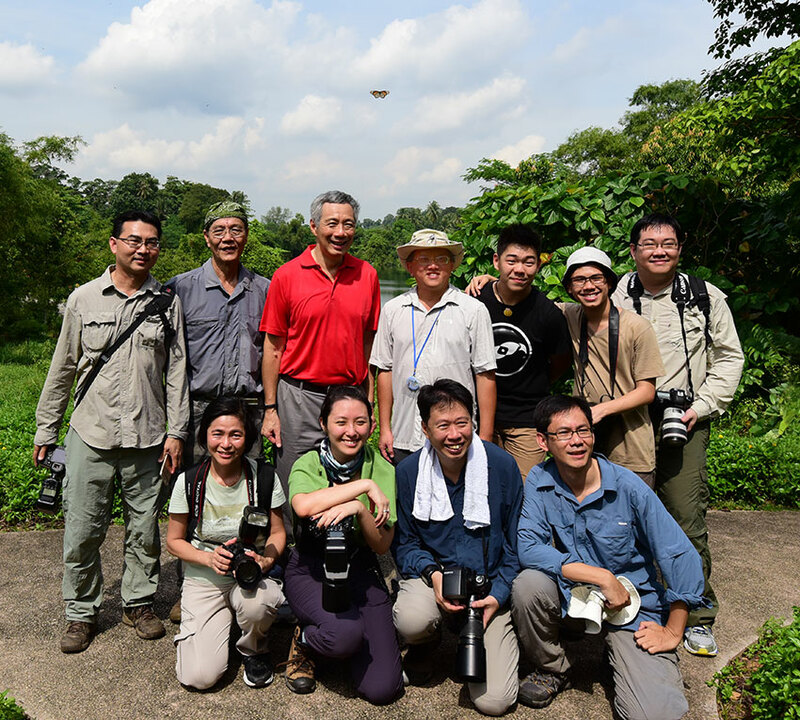 ButterflyCircle was one of the groups featured and where our Prime Minister Lee Hsien Loong made a special stop at Butterfly Hill to enjoy our fluttering beauties with us. We also continued with our series of Butterflies' Favourite Nectaring Plants with two new additions for 2014. 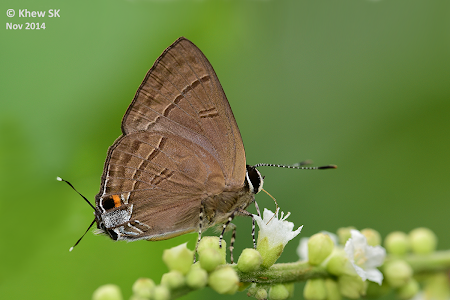 We featured Bandicoot Berry (Leea indica) and Red Tree Shrub (Leea rubra), as ideal plants which should be cultivated to attract butterflies (and birds) to our parks and gardens. 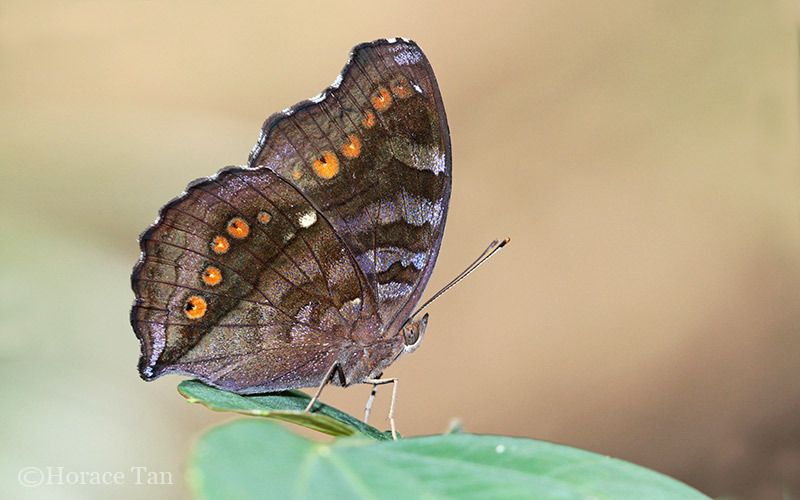 We look forward to 2015 and even more stories about our beloved flying jewels in the year ahead. We would like to take this opportunity to wish all our readers, near and far, a HAPPY NEW YEAR! A Merry Christmas and Happy 2015! And we are into the final weekend before Christmas. If you haven't done your shopping for presents and gifts for your friends and loved ones, you'd better panic! It's cold and wet here in Singapore, with heavy rain on most afternoons in the past week or so. 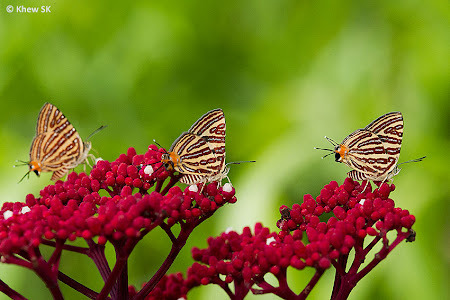 Going downtown to Orchard Road, Singapore's premier shopping street, and looking at the lights and decor, it does feel a lot like Christmas and one could almost expect a white-bearded ample-bodied man riding in his reindeer-powered sleigh up high amongst the skyscrapers. 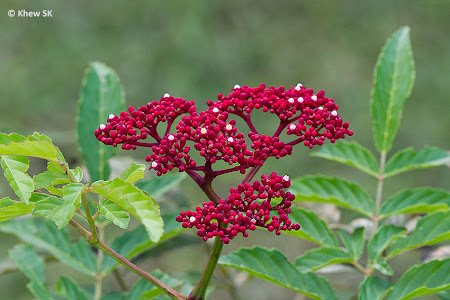 Ho Ho Ho. 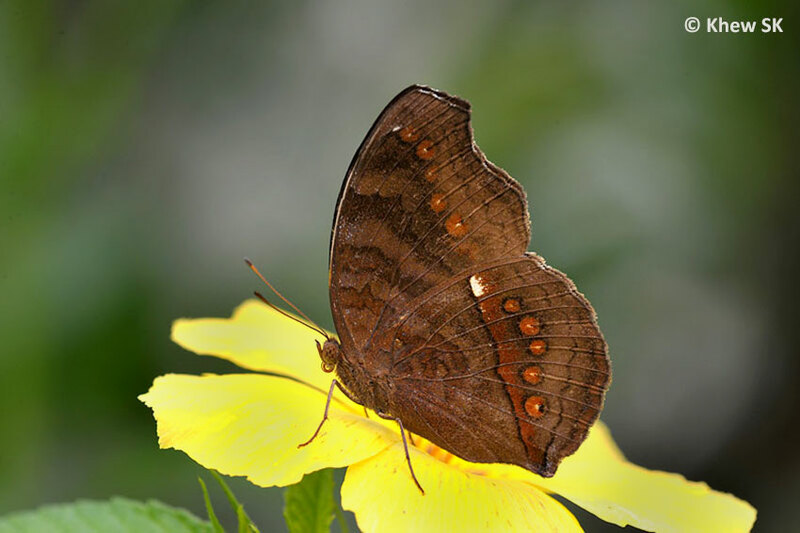 Even as we celebrate the spirit of Christmas across the world, there have been very depressing incidents that have happened this December. The first one was the hostage situation in Sydney where a lone terrorist held a group of hostages at a coffee outlet. After a stand-off of over a day, it ended with the police storming the coffee outlet, but with the tragic loss of two innocent lives. 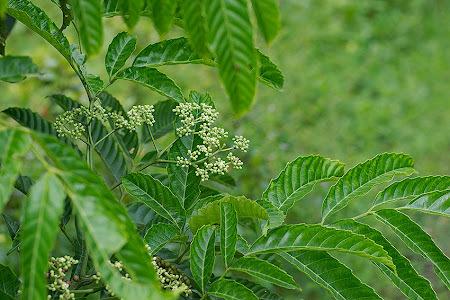 That the terrorist was also killed in the ensuing gun battle was expected and some say deservingly. 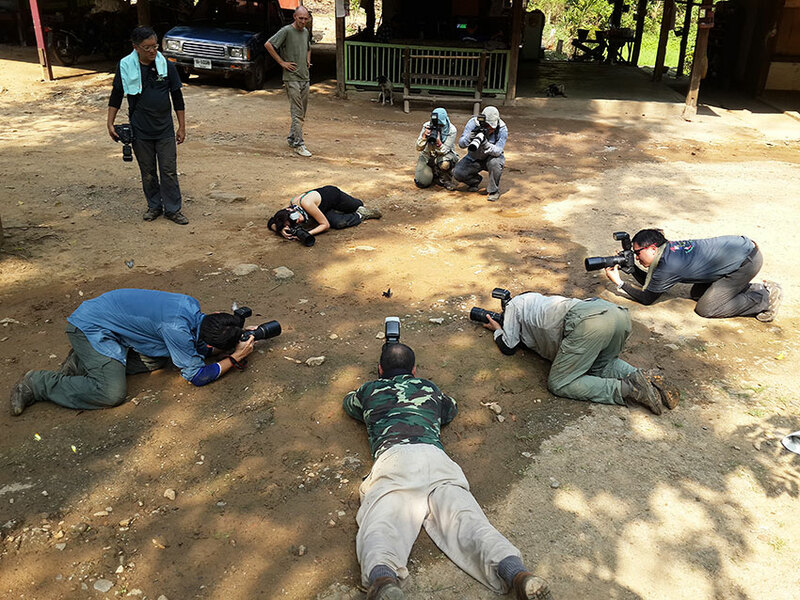 But if the misguided gunman was doing this all in the name of religion, then it portrays an even sadder situation. 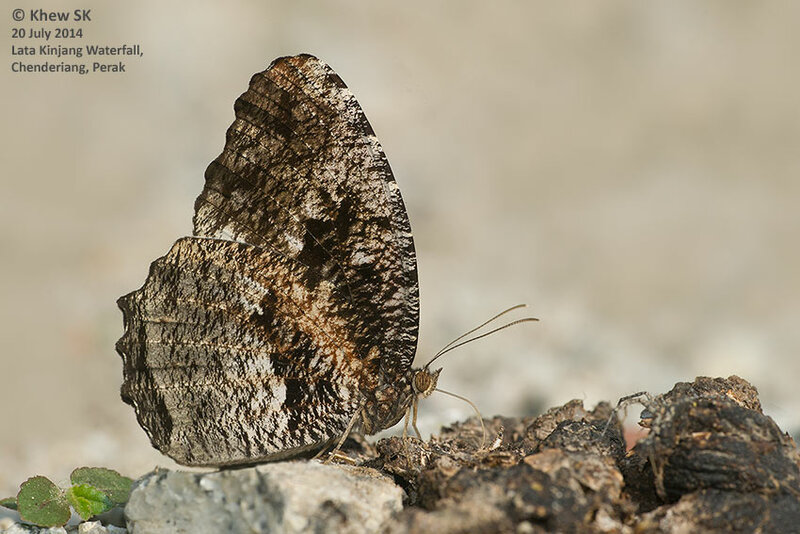 In a separate incident over in Peshawar, Pakistan, a group of Taliban terrorists stormed a school and massacred 145 innocent people, of whom 132 were children. 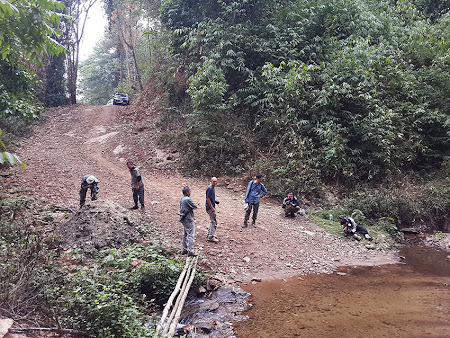 By the time the siege ended in the evening, military officials said all seven militants were dead. 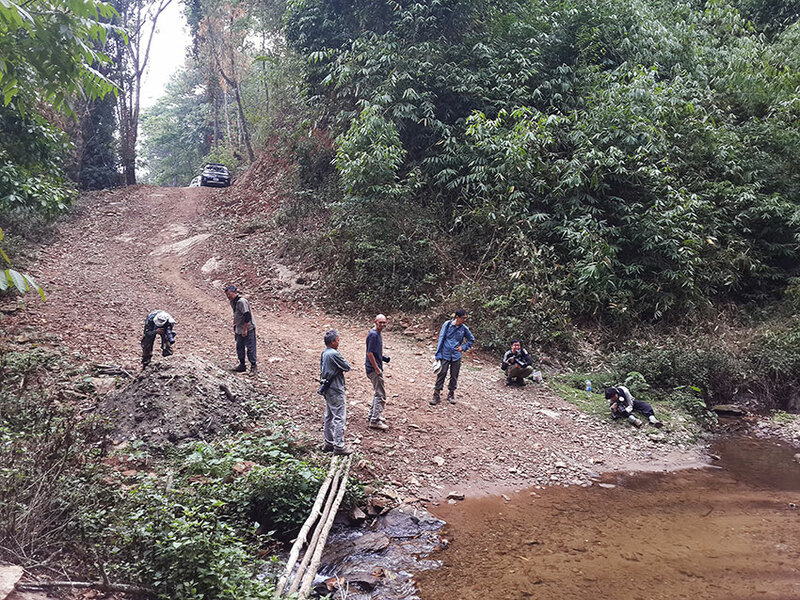 It's unclear whether they were killed by soldiers or they detonated their explosives. The casualty tolls don't include the terrorists. All this was done in the name of religion? Which religion teaches its followers to kill innocent women and children, I wonder. 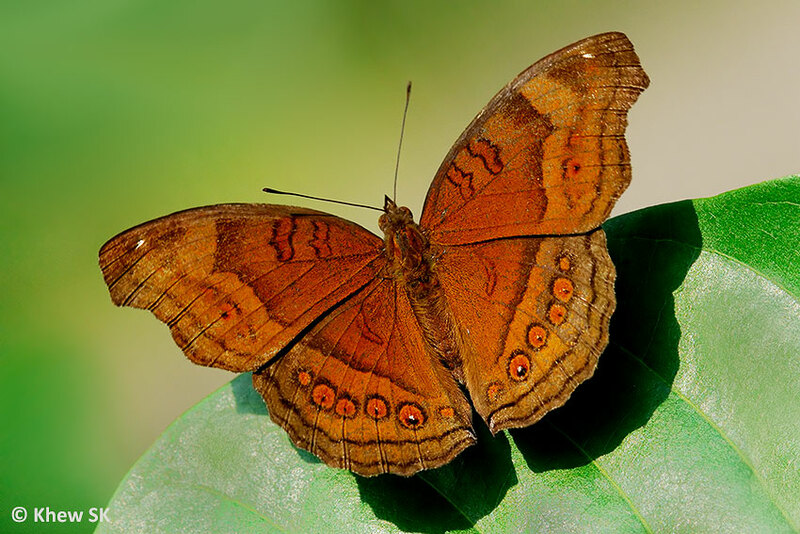 It's nothing to do with Islamic teachings or anything even related to any religion. 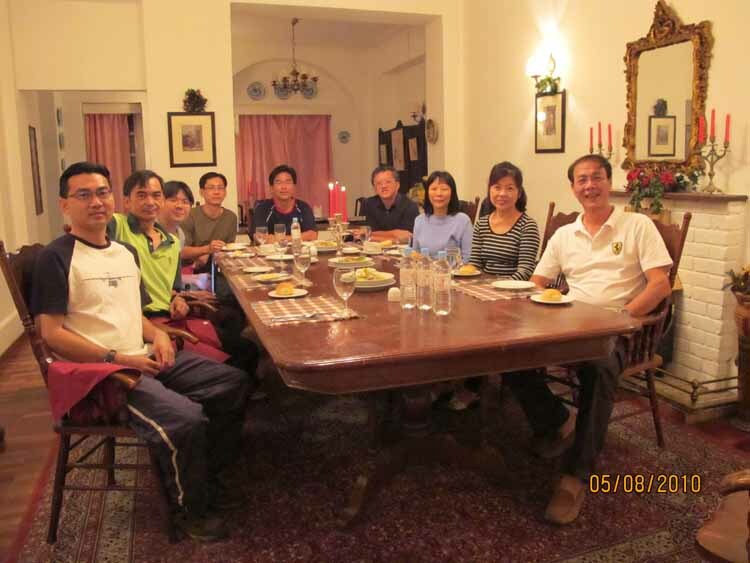 It is the ego and maniacal interpretation of a group of fanatics that brought out the worst in this group of people. 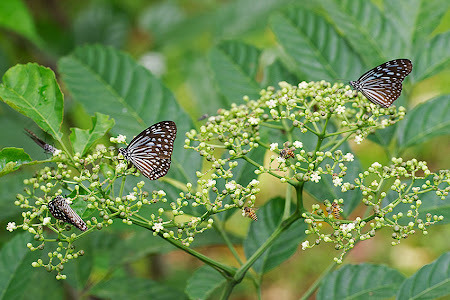 In this Christmas season, our prayers go to those who have lost loved ones and who have to carry on with their lives. And to also find it in their hearts to know the difference between the peaceful Muslims who practice their faith in harmony and respect, and those who have demonised themselves in the name of their religion. 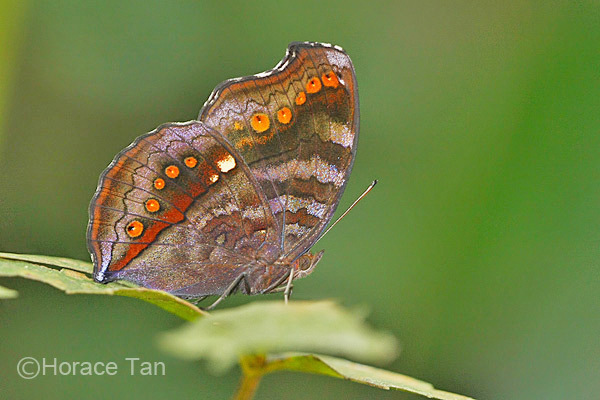 This month, we feature a rather drab and sombre-coloured butterfly, in keeping with the mood of the past few weeks. The Chocolate Pansy (Junonia hedonia ida) is a common butterfly in Singapore, and is widely distributed across the island - from urban green areas to the forested nature reserves; from the coastal habitats to the tops of our hills. 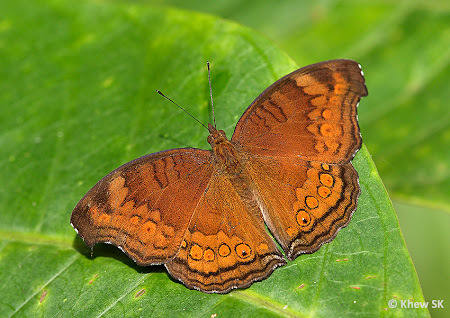 The species is reddish brown above and features a prominent row of eyespots on both wings. The underside is usually a lighter brown with obscure purple bands across both wings. 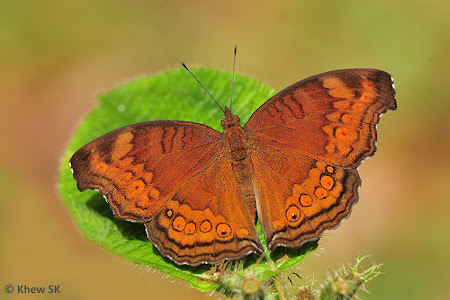 The ocelli on the underside are lighter and more orange. 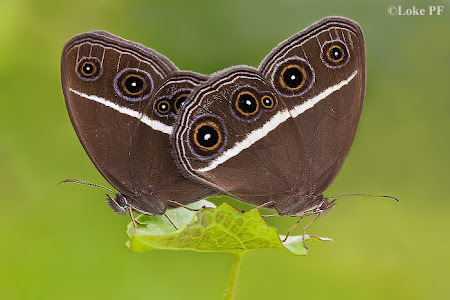 The median band on the underside of the wings is a poor attempt at giving some semblance of mimicking a leaf when the butterfly is at rest with its wings folded upright. The Chocolate Pansy has a flap-glide flight but is extremely skittish and not easy to photograph. 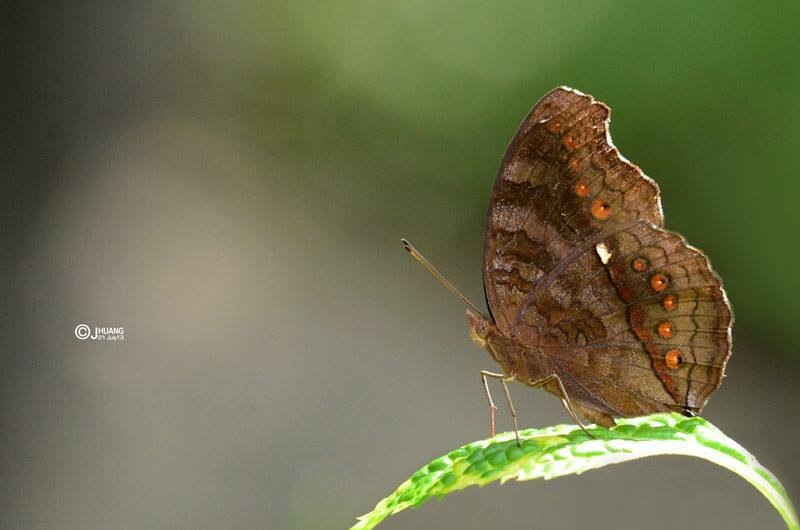 Being a common butterfly, it tends to get ignored by butterfly watchers and photographers. It has a habit of staying at a location with a few favoured perches, and then 'attacking' any intruders into its domain. On hot sunny days, it can be seen flying amongst low shrubbery and then stopping on the top sides of leaves with its wings spread open to sunbathe. 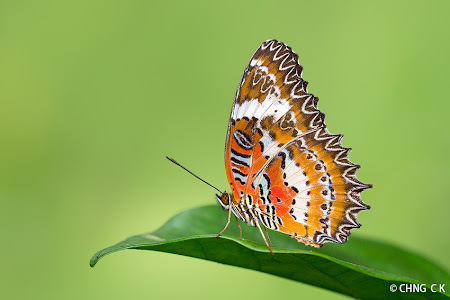 At other times, it stops with its wings folded upright at rest, displaying its undersides with the orange coloured ocelli. 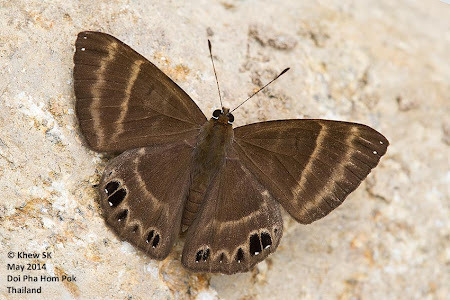 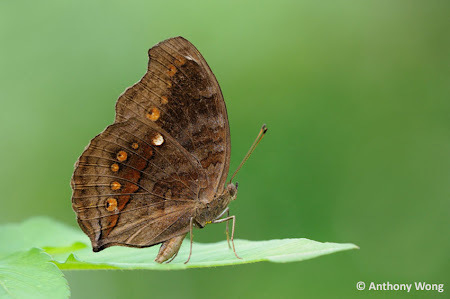 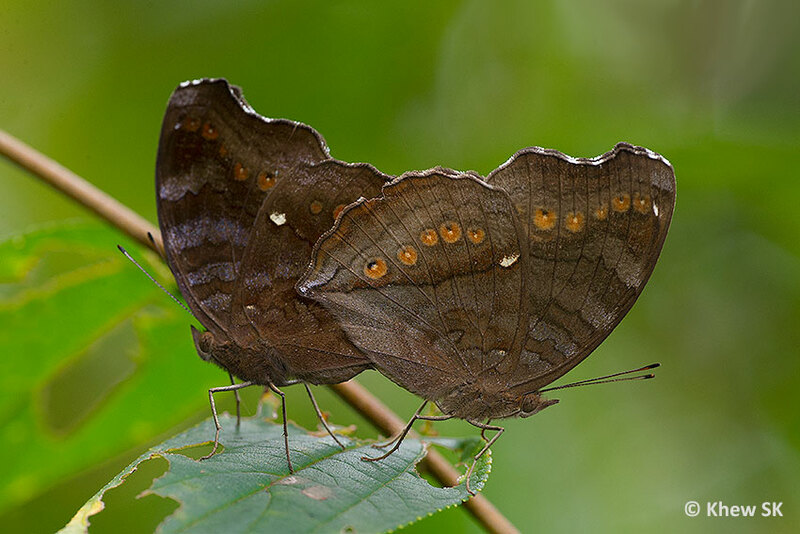 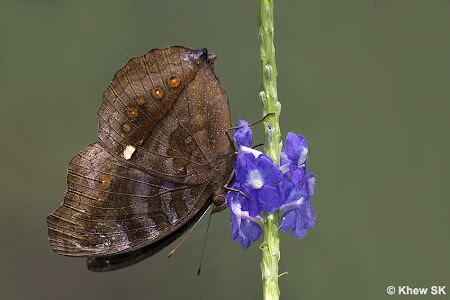 The closely-related species up north in Malaysia, Junonia iphita horsfieldi is given the name Chocolate Soldier in this region, although this species is also called Chocolate Pansy in other South Asian countries where Junonia hedonia ida does not fly. 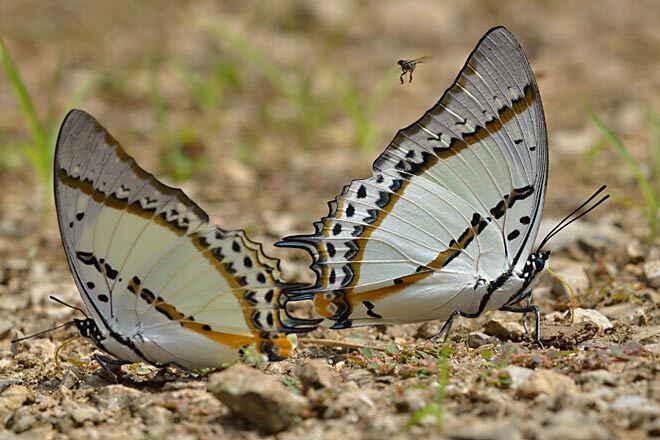 This may give rise to some confusion in the common name, where two different species are called by a single common name. The caterpillar host plant of the Chocolate Pansy are two common plants from the Acanthaceae family, namely Ruellia repens and Hemigraphis reptans. 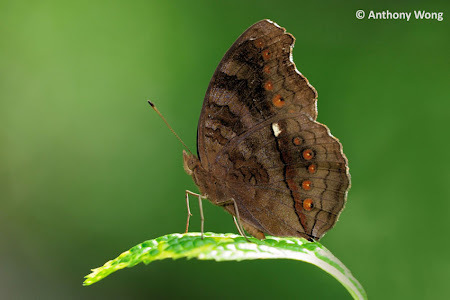 The full life history has been recorded successfully in Singapore and the details can be found here. And so 2014 has almost come to an end, and in our next blog article next Saturday, we will look back at the year and summarise the key events that made up an eventful year for ButterflyCircle. 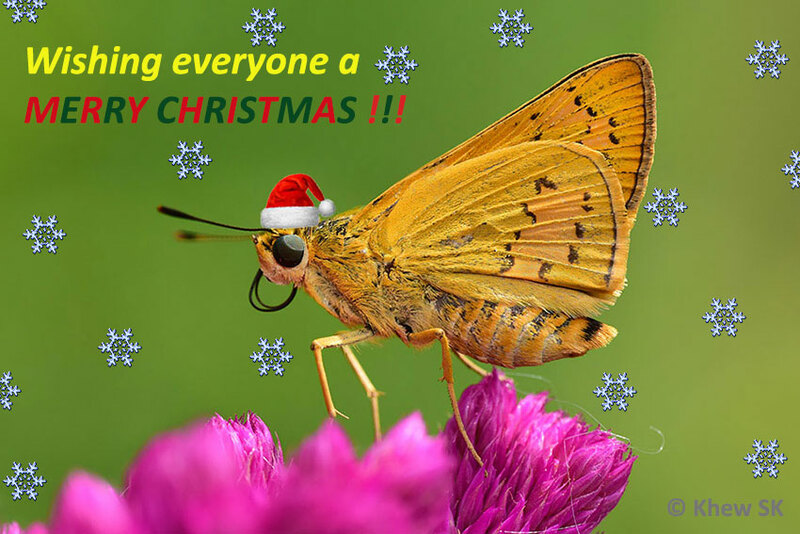 We would like to take this opportunity to wish all our readers a Merry Christmas!